Drexler performin in Santiago, Chile on 25 September 2010. Jorge Abner Drexler Prada (born 21 September 1964) is an Uruguayan muisicker, actor, an doctor specialisit in otolaryngologie. In 2004, Drexler wan wide acclaim efter becomin the first Uruguayan iver tae win an Academy Award. He wan for componin the sang "Al Otro Lado del Río" frae The Motorcycle Diaries. Like hintle o his faimily, he studiet medicine an became an otolaryngologist ear, nose an throat specialist. Drexler began playin piano at age five, afore attendin guitar an composition classes. Awtho he haed an interest in muisic, he became a doctor like baith o his parents. He attendit medical schuil in Montevideo. Durin his time in medical schuil, Drexler teuk a break tae hitchhike throu Brazil. He studied muisic an recordit two albums an aw, which wur anerly released in Uruguay. In 1995 he wis invitit tae Madrid bi well-kent Spainyie sangwriter Joaquín Sabina, who introducit him tae ither important Spainyie sangsters. Drexler went tae Spain tae record the album Vaivén in 1996 wi Spainyie muisickers. Vaivén includit some auld sangs frae his previous releases mixed wi new compositions. He muivit tae Spain an recordit anither fower albums: Llueve (1997), Frontera (1999), Sea (2001) an Eco (2004). Awtho he lives maist o the year in Spain, his latest three albums wur pairtially recordit in Uruguay wi Uruguayan muisickers. Juan Campodónico an Carlos Casacuberta, umwhile members o rock baund El Peyote Asesino, hae producit Drexler's albums syne Frontera. Efter that, he released 12 Segundos De Oscuridad (Dro Atlántic. 2006), this album contained ten oreeginal sangs, an twa covers: "High & Dry" frae Breetish baund Radiohead an "Disneylandia" frae Brazilian Titãs. In 2008, he released a double live album, recordit in diverse concerts in Spain: Cara B (Dro Atlántic. 2008), mainly filled wi aw the unuisual sangs previously unrealeased. In March 2010, he released Amar la trama (2010), recordit in juist fower days, wi the muisickers playin live on studio. His muisic is a combination o Uruguayan traditional music (candombe, murga, milonga, tango), bossa nova, pop, jazz an electronic muisic, which results in vera personal compositions wi oreeginal arrangements. The wirds play an important role in his sangs an aw. Apairt frae luve, reflections aboot identity, race an releegions are a constant in his wirk. Drexler's sang "Al otro lado del río" appeared in the internaitionally acclaimit film "The Motorcycle Diaries" (Spainyie title: "Diarios de motocicleta"). Tho Drexler hissel sang the sang on the movie soundtrack, it wis performit thegither bi Antonio Banderas an Carlos Santana at the Academy Awards ceremony. Upon his winnin the Oscar for Best Original Song, Drexler's "speech" consistit maistly o him singin a portion o the sang a cappella. He wis marriet tae sangster-sangwriter Ana Laan till 2005. His girlfriend is Spainyie actress/sangster Leonor Watling. She gave birth tae their son Luca in Januar 2009. Watling sings in the baund Marlango. ↑ "Jorge Drexler talks about his album '12 segundos de oscuridad'". Retrieved 2008-06-22. ↑ 2.0 2.1 2.2 2.3 2.4 Gurza, Agustin (February 27, 2005). "A songwriter's dream has disappointing end". Los Angeles Times. Eddy Hartenstein. Retrieved February 7, 2012. ↑ Rohter, Larry (2005-07-12). "Latin American Singer's Rainbow Coalition of Identities". The New York Times. Retrieved 2008-06-22. ↑ Bonacich, Drago. 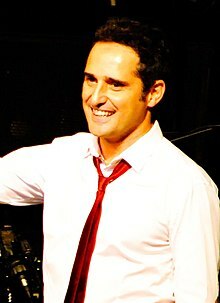 "Jorge Drexler - Biography". Allmusic. Rovi Corporation. Retrieved February 7, 2012. ↑ Gurza, Agustin (March 2, 2005). "Los Angeles Times". Eddy Hartenstein. Retrieved February 7, 2012. ↑ "Jorge Drexler en la entrega de los Oscar". Retrieved 2012-01-08. Wikimedia Commons haes media relatit tae Jorge Drexler. This page wis last eeditit on 23 Februar 2018, at 20:13.